Pike Island – Bike, Hike, or Have a Good Cry. 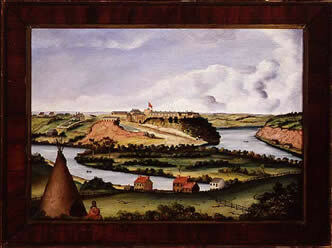 John Casper Wild 1804-1846, Fort Snelling in the background; Pike Island in the middle; the settlement of Mendota in the left foreground. Mendota, “where waters meet” was the subject of Monday’s post. Pike Island is plopped right in the middle of the confluence with Ft. Snelling looming to the north and Mendota, a few paddles away. The Minnesota River flows into Wild’s painting from the left. Note how wide the riverbed is compared to the gorge in the upper part of the image where the Mississippi cuts through the bluffs. The Minnesota flows along the bed of the ancient Glacial River Warren. Where the two join, the much larger Warren undercuts the Mississippi creating a falls. Over the years, the eroding river bed moved the falls up-stream to present day Minneapolis, what we call St. Anthony Falls. If the painting had more image to the right of the frame, it would include the eastern end of Pike Island and you would see where these two great rivers join ( Geology and Images ). Edward K Thomas oil/about 1850 - Sibley and Fairbault homes by the river, Pike Island and Ft. SnellingHere's another painting completed around 1850, by Edward K Thomas.Pike arrives at, imagine the coincidence, Pike Island. What are the chances of that? I’ve included an account of the negotiations between Pike and the Dakota passed on through the Dakota tradition from a recent publication of the Dakota Society of Minnesota newsletter. It’s a somewhat, darkly humorous re-telling of events. (Dakota Society of Minnesota ). There have been native Dakotas who laugh at the fact the agreement was signed by “only one and a half Indians,” Little Crow and the half-breed son of a trader named Pineshaw, chief of the closest village. The council held on the island now named after Pike was attended by Pike, interpreter-traders Frazer and Cameron, and Dakotas Little Crow and son of Pineshaw, both of whom signed the agreement as mentioned. Also present were LeGrand Partison, Tamaha, Shakpe, Redwing, and Vivid Lightning. In the Leavenworth Sioux treaty of 1821, J.B. Faribault, early fur trader and father of fur trading sons, and his wife Pilage were granted rights to Pike Island. After several years J.B. Faribault moved to Mendota and built the stone Faribault home that still stands today. 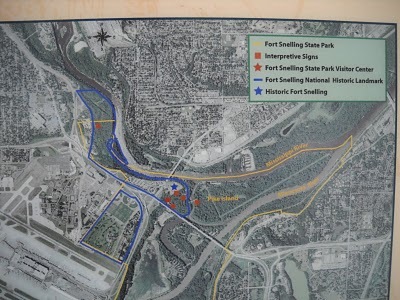 Pike Island is now part of Fort Snelling State Park. I think it’s interesting to note that, for awhile at least, this land was in the hands of Jean Baptist Fairbault’s wife, Pilage – a Native American woman owning at least part of Pike Island again. Jump ahead to 1862 and the Island history takes a tragic turn. Over 1,600 Dakota men, women, and children were marched here and interred from 1862 to 1864 following the Dakota/U.S war that briefly raged along the Minnesota River Valley. Prison Camp/Prison Compound/Internment Camp – These are some of the terms used by historians who have written about the events of 1862 to 1864. However, the Minnesota Department of Natural Resources, who administers the park land on Pike Island and Native American activists, among others, use the term, Concentration Camp ( Photo gallery at the Park ). What’s in the meaning of those two terms? Were the Dakota, legally held, prisoners of that war or was it a chapter in the campaign of extermination and removal of the Native People by the U.S government? Those are my questions but they delineate the controversy between two, seemingly irreconcilable, points of view. It’s an ideological stand-off framed in powerful language challenging the others’ interpretation of events. The words are loaded with meaning and as symbols represent many unresolved issue’s of Minnesota’s past. Who gets to tell the story? Here’s a link to a recent book on the subject – The Dakota Indian Internment at Ft. Snelling, 1862 to 1864 Whichever terms you choose, prison camp, concentration camp, or another, over 300 individuals are believed to have perished. (Monjeau-Marz, Corinne L. (October 10, 2005). 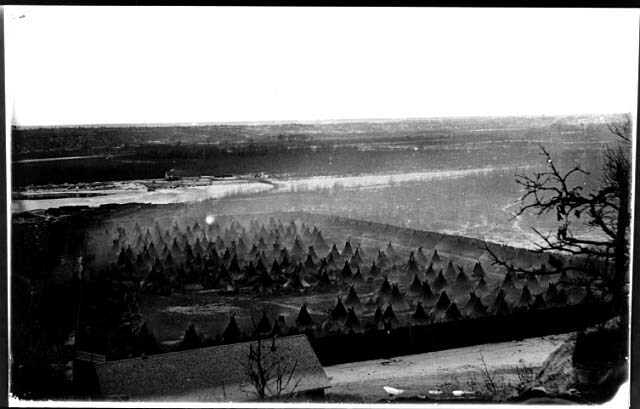 Dakota Indian Internment at Fort Snelling, 1862–1864. Prairie Smoke Press) – At posting, I don’t have a second source to back this figure up. It was a big news day at the Capital on Monday–Gov Pawlenty released his new budget. It was also “Rally for History” Day in the Capital Rotunda, a day set aside to celebrate Minnesota’s history. Many were surprised then, that for some it wasn’t a day to celebrate. The Rally for History crowd, applauds at the start when the protesters are led away. For some, it’s a day to mark a genocide in Minnesota. This is the third year in a row, Dakota activists have challenged the funding of Fort Snelling. They find this all the more troubling, given that Gov. Pawlenty announced millions in social spending cuts, the same day. 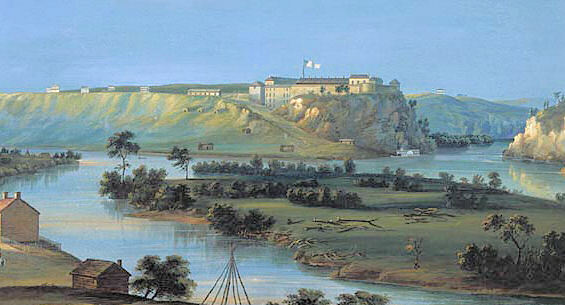 The Minnesota Historical Society, is asking for $6.7 million to preserve Fort Snelling, at the confluence of the Minnesota and Mississippi rivers. Activists point out : This fort is a replica not the original, and that this site is not only what is considered a genocide inside the Dakota community, but it is also the site of their creation story, it is sacred ground. I talked to several activists in the rotunda, including Eric Angell and Dr. Waziyatawin, who explained the Dakota viewpoint. Also, we see in the video their unfurled banners from the balcony, and we see activists asked to leave by State Troopers when they unfurled a banner in front of the Rally for History speakers. No arrests were made. Pike Island – Is it a place to hike trails, ride bikes or sit in quiet reflection? Is it a sacred site and a former Native village, home to the Dakota? Is it a historical treaty site and birthplace of modern Minnesota? Does it echo with the suffering cries of those who perished there? Yes. This entry was posted in Minnesota River, Mississippi River, Music and Video, Native Americans, Pike Island and tagged Dakota, Ft. Snelling, Minnesota History Society, Ojibway. Chippew. Sioux, Pike Island. Bookmark the permalink. 4 Responses to Pike Island – Bike, Hike, or Have a Good Cry. Wow – it was named Pike Island and Zebulon Pike went there! What are the chances? Corey here – I got a nice note back on this post with a great Pike Island childhood memory. Here it is. Nice job Corey, another voice for Truth and Justice for those whose ancestors lived, loved, and honored this area for countless generations. Opening this discussion to the injustice and genocide which was perpetrated on these people and these sites, begs recognition of the truth in this matter.